A beautiful example of timeless style, combined with generations of Amish artistry, allow our Siesta Mission Dresser to serve as a wonderful storage solution for a variety of different bedroom decor. Once constructed, the time and care that goes into each piece ensures a lifetime of use that can be handed down for generations to enjoy. 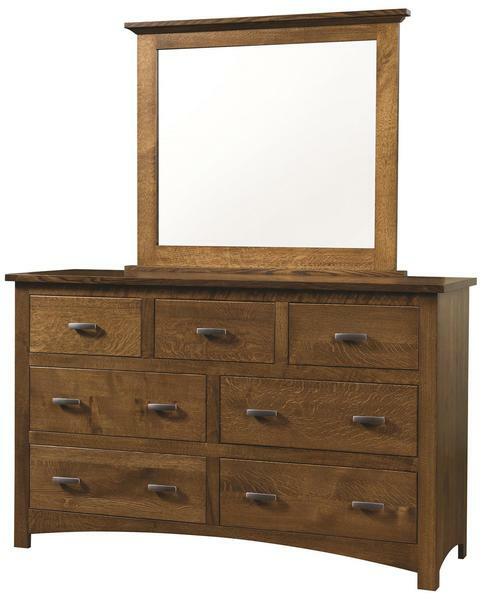 When it comes to inspiration, the Troyer family took cues from the Arts & Crafts Movement and Stickley Mission style to come up with a classic Craftsman-era Dresser that offers flat sides that case a range of flush-mounted drawers in front, topped with a thick solid top above, and trimmed with a graceful arch that surrounds the classic l-shaped feet. From every angle, this dresser inspires a sense of authentic antique beauty, with the versatility to look great in any bedroom suite. While we've shown this piece in the most common Quarter Sawn Oak with Michael's Cherry finish, this is only one of the many ways we can customize this dresser. Start by choosing from a variety of different North American hardwoods - each with their own story to tell. Once selected, you'll have the option of stain finish, allowing you to match you existing bedroom storage items, or starting fresh with your favorite. The optional beveled edge mirror offers the perfect add-on, cased in the same gorgeous hardwood and finished with the same stain, you're sure to find it perfect for taking one final glimpse as you head out for the day. Standard with full-extension side-mount glides, you can also opt for the soft-close under-mounted glides to incorporate a little something extra into the final touches. If you have questions, please don't hesitate to call and speak with one of our furniture specialists. We are here to help you furnish a suite that you can enjoy for a lifetime, and we know that decision isn't an easy one. We have stain samples available to help you confirm your decision, along with a close line to the woodshop to provide custom quotes to tailor the Siesta Mission collection to suit your unique needs. I was just dusting our beautiful furniture, and I was reminded that I hadn't thanked you for the furniture polishes, and the adorable, (and delicious smelling!) soap. You have helped make our business with DutchCrafters even more pleasant! The mirror arrived safely yesterday afternoon, and we got it installed in the evening with no problems. Thanks for packing it so carefully, and for all you have done. It set is SO lovely, and the beveled glass makes it perfect!